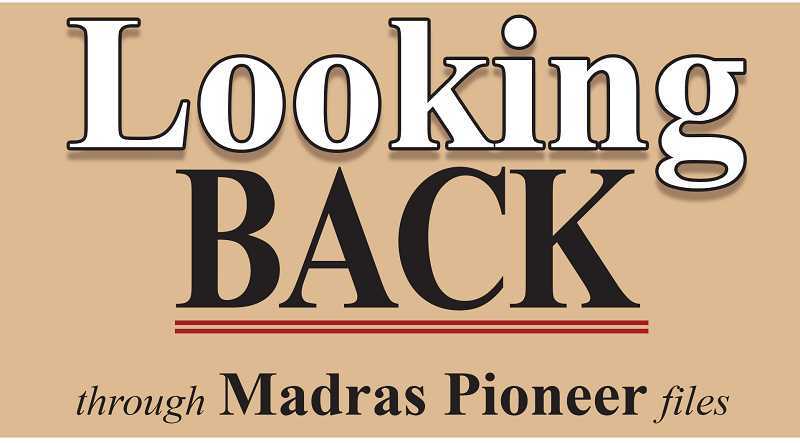 A train loaded with all kinds of relics and souvenirs of the war is to visit Madras Sunday, April 6, according to announcement of Victory-Liberty Loan officials. The train is to be officially designated as the "Trophy Special" and is to make a complete tour of the state, making stops at all points reached by railroad. The object is to give the people of Oregon an opportunity to see war instruments and implements of which they have often read about but have never seen. At the places visited, the train will be open to all visitors and the exhibits will be explained by competent attendants accompanying the train. The tour of the train will be made under the auspices of the Victory-Liberty Loan, which will be the fifth and last loan. The loan drive opens on April 21. The exhibits will be furnished by the war department. Word has been received at the Portland headquarters of the loan committee that the relics have already been shipped but owing to the uncertainty of their arrival the committee is unable at this time to set a definite schedule for the train. This will be arranged as soon as possible and due announcement will be made. The train will consist of two flat cars, bearing the bigger relics, such as guns and equipment, and one exhibit car carrying the smaller relics and souvenirs. A list of some of the exhibits are as follows: French baby tank, German minewerfer and howitzers, German Albetros motor, German field guns, trench mortars, gun limbers, airplane motors and parts, parts of Zeplins, barbed wire used at Verdun, machine guns, uniforms of all nations, noise bombs, star shells. The following letter came to us with a Spokane address, but no signature. It is interesting, so we are reprinting it herewith. It was all of 30 years ago, yes even more. Madras has changed quite a bit. There was a fine flour mill there then, right about where a hotel stands now. Two Germans used to run it, Deitzel and Drexel. Deitzel loved pigeons and he had an enormous flock of them, finally had to house them in a great cage because people complained. I always used to think they were pretty flying about free. There was a poor family, the father was sort of a veterinary that used to dress the squabs and send them to the Portland market to add a bit to the family income. It didn't help much as the father drank so. Down near the creek there were a couple of houses. An old nurse owned one; she'd been a fine nurse too in her day, they said, but she'd gone downhill. She used to go by our house every night with a tin pail to get beer at the saloon. There were several whopping big livery barns in town; one was owned by a man named Staton, he ran for sheriff once but didn't get the office. He had a big team that used to run away once in a while and everybody scattered when they ran wild, draft horses they were. Everybody in town had a cow and they used to have a boy take them down in the canyon under the big bridge to pasture every morning. We used to buy our milk from Branstetters that lived across the street from the Methodist church until we got a cow of our own. There were lots of wells around town too, not very good ones though, I guess, as they were trying to get city water. There was a family of Barnetts too, two brothers and two sisters, and a young niece with yellow hair that worked in the telephone office. The sisters were twins I think; they used to take care of old people and they were very kind. The depot agents name was Wait and his daughter Ora was the first graduate of the high school, it seems to me. There were four to graduate the next year, Bessie Uren, Beatrice Olsen, Guy Powell and Aurel Moore. Near where the butcher shop stands now, there was a small hotel run by the McTaggerts. Ruth McTaggert played the piano very well and people would sit outside on summer evenings to hear her. There was another hotel down near the garage that Bill Moore owned and a big livery barn fairly near for the convenience of the guest, not many cars in those days. The hotel had a horse-drawn bus that met the trains twice a day, too. All the kids in town used to try to hitch a ride up the hill to see the train come in. If the bus had too many passengers, they had to walk the mile back to town. Up on the hill, there was always a line of water tanks at the railroad tank, filling up with water for the homesteaders had to haul every drop. The old Central Oregon was the biggest store in town and I recall they used to deliver twice a day with an old white horse keeper by the name of Joe Warren; he took a mail route later on and he could write a book on the Model T Ford, to say nothing of Jefferson County roads, past and present. I had a holy respect for the doctor. In those days, he had a way of holding your nose when you thought you wouldn't swallow a dose of medicine and brother — you swallowed. His gracious young wife had a fine voice and sang songs over at the Christian church. We weren't just sure which church we'd go to, then a tall lady in a white dress and sun bonnet came to see us and invited us to go to the Methodist. I guess there never was a family moved to town that she didn't invite to her church. They had a big white apartment house up on the hill and although they had no children of their own, they probably were more interested in making the town a better place for kids than most of the parents. We had some good Sunday school parties on their lawn. The banker had the nicest house in town, Olsons bought it later on; that is until Morrows put up their big house. There was a young couple by the name of Pilette that had two little boys; Mr. Pilette ran a lumber company. The barber was a fellow by the name of Smith, but he moved up to Redmond later on, I think his wife came from the Lamonta country. There wasn't much to do on Sunday afternoon. If you were ambitious, you took a hike down in the canyon, as far as the twin tunnels, or maybe went up and walked across the big bridge. There was a dentist named Clark too; his wife was a good dressmaker. Travelers speeding along U.S. Highway 97 through Central Oregon usually pass Shaniko without slowing. Yet this scattering of weathered buildings in the middle of a grassland plateau, only a few hundred yards from the highway, is a relic of the Old West and well worth a visit. Sixty years ago, Shaniko was a sizeable town, terminus of the only railroad to the interior of Oregon and in 1905 and 1906, a major wool-shipping center. Thousands of sheep grazed on the plains nearby; freight wagons fanned out from town carrying supplies and returned piled high with wool; cowhands and sheepherders swaggered from saloon to saloon (they had 13 to sample). Some of the last range wars were fought nearby. The town lived high in the decade after 1900. In that year, Shaniko became the railroad terminus, and the wool-shipping boom followed. The town's final prosperity came in 1909, when it was headquarters for construction workers building a new railroad line up the Deschutes River canyon to Bend. Then, bypassed by the new track, Shaniko's influence as a shipping and trading center diminished rapidly. No ghost town, Shaniko still has about 80 residents today. Much of its activity centers on the impressive two-story brick Shaniko Hotel, built in 1900 as the Columbia Southern, "Queen of the Highland Hostelries." Most of the 27 rooms are steadily occupied by pensioners who formerly worked on nearby ranches. Perhaps someone will point out to you one of the bullet holes — there are several — remaining as mementos of early day arguments. The word Shaniko comes from the way the Indians pronounced the name of pioneer settler August Scherneckau, whose ranch house was a station on the old stage road from The Dalles to Central Oregon. They called the plateau Sim-pa-te, "summer camp ground," where they came to dig roots for food and medicinal uses. Crews rushed out to the Crooked River Gorge Monday when a vehicle was seen smashed on the rocks some 350 feet below the bridge. Jefferson County authorities didn't know how long the vehicle had been there. Highway Division workers noticed the vehicle that morning while fixing fence along the southeastern section of the gorge. Eventually, two men from the Deschutes County Search and Rescue team rappelled down the canyon to find the smashed remains of a 1987 pickup that had been reported stolen about a year ago. It was later noted that Deschutes County Sheriff's Office discovered the vehicle last April, but Jefferson County had not been notified of it and the vehicle had not been taken off the computer as stolen, according to Jefferson County Sheriff Mike Throop. While at the canyon bottom, one of the rappellers discovered a money bag that was stolen from Sonny's Restaurant and Lounge in December. The bag included checks but no cash.